Really, it’s true. Though, I would have to say that the pierogi is beyond delicious. Now, I know what you’re thinking. Poland doesn’t exactly sound like a top-rated destination. So why would I go there? There are many reasons, actually. If I could, I’d go back all over again. I spent the weekend in Krakow, which is in the south. To say that it’s an amazing city is an understatement. It’s so full of rich culture and history. Our hostel was about a five minute walk away from the Krakow Castle and only a few more from the main center. We spent a lot of time exploring and just enjoying. Krakow reminds me of a mix between Prague and something more modern. The remnants of communist influence are still there, but the city feels like it’s moving toward modernity. I just loved how old the city felt, but it wasn’t so left behind. Our big trip of the weekend however, was actually about 65km away from the city. One thing three history majors absolutely could not pass up was a visit to Auschwitz-Birkenau concentration camps. In fact, I believe it’s not something anybody should pass up. It made for a very intense day, but I believe I understand so much more about the history of WWII and the Holocaust. It’s truly an experience I will never forget. I spent the entire day feeling numb and just shocked in general. It’s so easy to learn about the Holocaust in school and think you understand what happened, but it’s a completely different story to go there. It’s more about a feeling that you get when you’re there. To be walking where thousands of people were murdered and forced to labor until they were simply too exhausted to go on is an indescribable experience. I cannot possibly convey to you how truly sick I felt with all human beings at that moment. To be in a place where innocents were put through trials tougher than anything any one of us will ever face is gut wrenching. It was an awful day, but I am so glad that I experienced it. I believe that everyone should go to a concentration camp at some point during their life. We need to be reminded of these horrors in order to assure that nothing like this ever happens again. It may seem like what happened in Auschwitz and the hundreds of other concentration camps around Europe was a long time ago, but it really wasn’t. Auschwitz was only liberated 67 years ago. There are people alive today that can still remember it. I also visited Sachsenhausen concentration camp outside of Berlin over spring break and even though that camp was also liberated in 1945, it was still used by the Soviets for another 10 years. Not everything ended when WWII did. We must keep that in mind. If this post comes across as a bit preachy, I apologize. This is a subject I feel very strongly about and I want to do my part to make sure the horrific events of WWII are never forgotten. My trip to Auschwitz is something that will stay with me forever and I am glad for that. However, even though I’ve seen the worst in humanity, I’ve also seen some of the best as well. I met some of the friendliest people while I was in Germany and Poland. People of today should not be blamed for their predecessor’s actions and I honestly believe that the world is working toward becoming a better place. 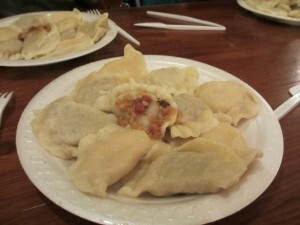 And to leave you with one final, happy thought, here’s a picture of some of the most delicious pierogi in the world.